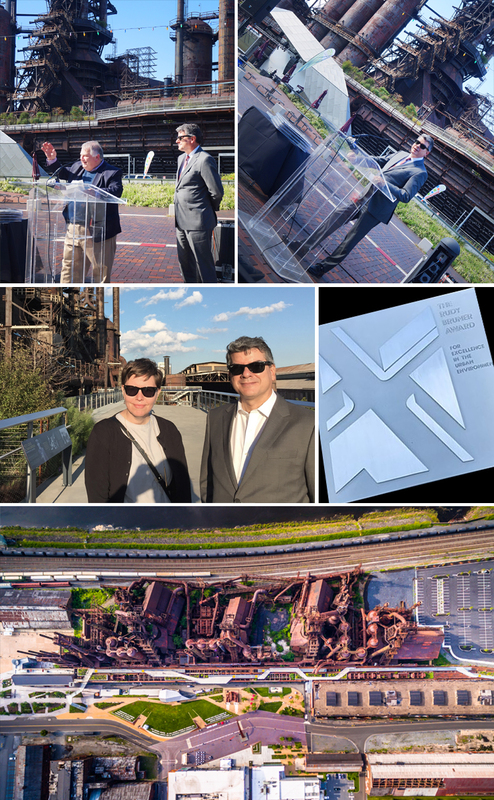 Bethlehem’s SteelStacks campus was presented with the national Rudy Bruner Award for Urban Excellence on Thursday September 7th. This multi-phased project was a part of a public-private partnership that involved, among others, the Bethlehem Redevelopment Authority, ArtsQuest, PBS39, and the Sands Casino Resort Bethlehem, who donated the land on the historic Bethlehem Steel plant site. On behalf of this multi-award winning project, Tony Hanna, Executive Director of the Bethlehem Redevelopment Authority, accepted this gold medal award - the Rudy Bruner’s highest recognition of urban places distinguished by their economic and social contributions to America’s cities. SITIO's Antonio Fiol-Silva spoke about the unique challenges of the site and the transformational impacts that enhanced a vibrant arts and cultural community. Fiol-Silva lead the SteelStacks Master Plan, The Levitt Pavilion, and the Hoover-Mason Trestle projects as Principal-In-Charge and Planner, and Karen Blanchard was the Design Architect.